Hamlet! It hasn't been at the Met in 113 years. It's a five-act French opera by Ambroise Thomas that premiered in 1868. Louis Langrée conducts. Simon Keenlyside plays the brooding Danish prince. Marlis Petersen plays Ophélie, Jennifer Larmore plays Queen Gertrude and James Morris plays Claudius. The final performance is tonight. When I see a performance like this, it's like getting the wind knocked out of me and I'm so excited I can hardly fall asleep. Every moment of this Hamlet is thrilling. Other than its fairly ugly set by Christian Fenouillat, it's a beyond fabulous production. 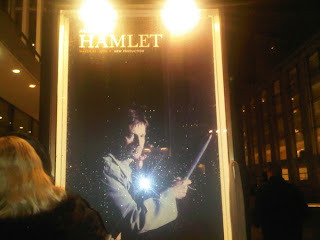 Hamlet is long, I know that from seeing it on Broadway last summer. But the pace here is fast. It's interesting to know the story and many lines from the play, but since it's opera it's all sung through making it an edge of the seat experience. The production is by Patrice Caurier and Moshe Leiser and they don't waste a moment, directing some very physical scenes, especially between Keenlyside's Hamelt and Larmore's Gertrude. At one point, he dragged her across the stage by her arm - thrilling! Christophe Forey's lighting is also gorgeous, setting the mood from the very first moments. Ophélie's mad scene by Petersen was brilliant. She was completely on the edge - singing insanity with incredible power while still managing to sing it heart breakingly beautiful. Larmore, who is rarely at the Met, sang as if she was going to milk every moment for what it's worth. Keenlyside, so handsome with the mix of broodiness and aloofness, was fantastic. In fact, the entire cast sounded gorgeous - including that Met Chorus. The score is gorgeous too. I was expecting sort of Verdean, but it's actually light and sweeping and at times menacing. I won't soon forget this production. Unfortunately, it's not on the Met's 2010/11 season list, but I hope it will return the next season. I also hope that the Met doesn't wait so long to bring back Marlis Petersen, Simon Keenlyside and especially Jennifer Larmore. The broadcast of Hamlet made me wish that I could have seen it. When you heard about Dessay withdrawing from the run, were you just a little anxious? I know I was, for I had never heard of Petersen prior to this. The fact that she stepped into this production on such short notice and right after another production in Europe makes this tale and the ensuing performances even more fantastic, and I am sorry to see that the Met did not include it in their next season; moreover, notice that Dessay is given Lucia di Lammermoor again. I am excited for Le Comte Ory with Diana Damrau, Juan Diego Florez, and Joyce DiDonato. What are your preferences for next season? Anxious? About a performer? No. Never. I have other things to be anxious about. Besides, I had already heard the NPR interview with Petersen. The Met wouldn't hire anybody who couldn't step in with perfection. Hmmm, about next season. I haven't thought about it too much. I will probably see Cappricio, Nixon in China, Don Carlo, Boris Godunov, and some of the Ring. Overall, the season isn't that appealing to me for a change. If you have not seen Peter Mattei I suggest you attend one of the spring Bohemes in which he will sing Marcello. He's also in Queen of Spades but his role - Yeletsky - is basically one (stunning) aria (which is the role that brought Hvorovtovsky to Met stardom) and one scene. Mattei is six feet four with a gorgeous lyric baritone. My favorite baritone (I traveled to the Met 4 times last season to see all his Giovannis even though I live outside Philadelphia and had to take a 3 am Amtrak home each time) and now that Philip Langridge is sadly gone, my favorite living singer. Saw Hamlet at an HD encore last night and loved it. No doubt that James Morris has a serious wobble but as long as he is not singing legato (no more King Phillips for you!) he is incredible to watch. Will be seeing him and Marlis Petersen in the upcoming Lulu. And Simon blew me away with the intensity and naturalism of his Hamlet, not to mention his voice. Really want to hear him sing Giorgio Germont if only to hear him sing Di Provenza.